Top Points and Payments	Do Points Expire? After logging in, you will be able to see the number of points that you currently hold on the upper right of the page. If you move your cursor over this number, the point expiration date will also appear. The point expiration date indicates the amount of time you have to make lesson requests. 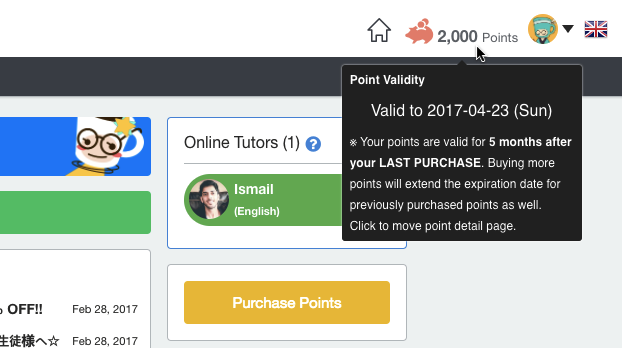 Therefore, it is still possible to take lessons after your points expire as long as you make the request before the expiration date. Points are valid for 5 months from your last purchase.